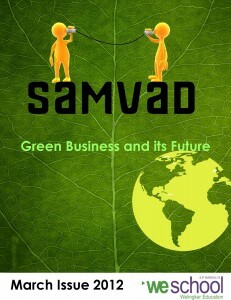 Overwhelmed by the warm reception of the first edition of Samvad we now proudly present to you the second issue . The enthusiasm to participate seems to have gone viral as it has increased manifold. The second edition not only brings you the ideas of fellow Welingkarites but also of students from other colleges. The excitement has spilt over the boundaries of WeSchool into other campuses resulting into a number of articles from them. ‘Green Business and Its Future’ the central theme for the March edition has drawn articles from across all the specializations – Marketing, HR, Operations and Finance. The articles have been screened by our team under the guidance of our esteemed professors. The articles range from ‘Eco-Innovation’ to ‘Green Supply Chain’ and ‘Green Marketing’ to’ Green HR’. It has been our sincere endeavor to bring to our readers the best of the ideas together on one platform and we will continue striving for the same. March was an eventful month with a series of high profile events dotting it .These have been covered in the section titled WeAct, with the visit of esteemed President Pratibha Patil being the most significant. Our section WeCare talks about Project Udaan, an initiative which aims to aid the youth from Kashmir by helping them hone their skills and thus enhancing their employability. For the April 2012 edition of Samvad, we are inviting articles from all domains – Marketing, Finance, Operations and Human Resources. The theme for the edition is ‘Innovation’. Also, do visit our Facebook page: Samvad: WeSchool Student Magazine and be a part of Samvad. We welcome your feedback and comments. We would like to thank all our readers for their contributions and support. The astounding response from our readers has made us reinforce our belief that Samvad will create ripples across the campus and beyond. Click here to read the March edition of Samvad. Click here to download the March edition of Samvad.